Hiking is one of those pleasures that only some (extremely lucky) people get to experience in their life more than just once or twice. Hiking in Oregon, however, is an experience that even luckier people get to experience. The US state is famed for its diverse landscape of forests, mountains, and beaches, and offers the novice and practiced hiker something they will absolutely adore. But with so much diversity in Oregon, it’s difficult to choose where’s best to hike. So, we thought we’d help you out a little. Without further ado, here’s our list of the top 5 hikes to do in Oregon. Though Mount Hood is a potentially active volcano, its potential as a hiking destination is simply fantastic. With bright greenery and the snow topping the mountain, the scenery on this hike is simply fantastic. Hiking to the top of Mount Hood will take around four to seven hours if you are in good shape. Otherwise, you should expect to spend between six and nine hours on your climb. There are a whole lot of trails to complete on Mount Hood, our favorites being the Lost Lake Area, Waucoma Ridge Area and Salmon River Area. The Crater Lake National Park is one of the most beautiful places on earth. The striking blue lake has made for a popular hiking destination in Oregon alongside a backdrop of bold cliffs and isolated islands along the way. Hiking in Crater Lake National Park can also be a technical challenge for seasoned hikers. Wizard Island is a volcanic cone formed at the west end of the lake. It’s tricky and challenging, and something that makes hiking in Oregon unique and well worth the attention of hikers from all around the world. One of the most epic hikes in America can be found in Bend. This small city located in the heart of Oregon offers a plethora of natural wonders, including the Cascade Mountains and lakes, Pilot Butte, an extinct volcano, and the Lava River Cave. Our favorite hiking trail in Bend is the Pilot Butte. Hiking up this dormant volcano is extremely simple, but incredibly rewarding. If you follow the Nature Trail, however, it adds an extra element of challenge to the hike. It is basically a dirt track with some steep sections along the way. The view from the top is simply stunning, and you’ll be glad you spent a day or an afternoon hiking to the top. Located in Oregon’s high desert, the Smith Rock State Park is a unique hiking location if there ever was one. There is a great opportunity to try some rock climbing here as the sheer rock faces are just perfect for those who enjoy adrenaline sports. However, for the avid hikers, this park has so much to offer. With easier hikes to incredibly challenging ones, you are spoiled for choice. A great and challenging hike at the park is the Mesa Verde Trail which brings you up from the river to meet at the base of Monkey Face. If you’re looking for something a little easier than the strenuous Mesa Verde, the Canyon Trail will satisfy your preference. This trail offers some of the most stunning views of the park. From greenery to rocks to rivers, it’s all on this trail and it’s not even too difficult to complete. It’s perfect for families and pets too, so if you’re an adventurous unit, you’ll love this trail. 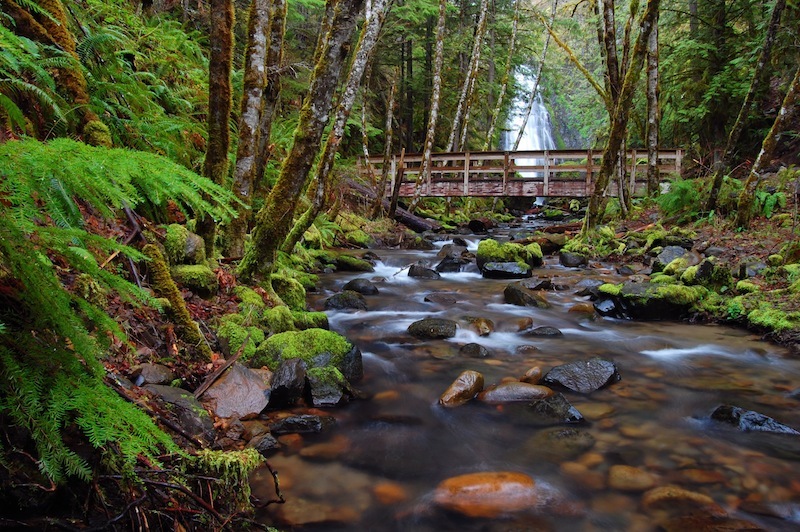 Hiking in the Cascade Locks is an experience like no other, so it just had to be on our list of the top 5 hikes to do in Oregon. Hiking through a gorge is a connection with nature like absolutely no other, and it’s simply wonderful. Hearing the pouring waterfalls and inhaling the fresh air is something that doesn’t get boring, making for a truly lovely hike in Oregon. There are very few cities that harbor such natural wonders as the Cascade Locks, so we suggest making the most of them while in Oregon. The Bridge of the Gods at the gorge will also take your breath away, so make sure to embark on a trail which incorporates the bridge.